In 2016, 28 armed conflicts were waged in 26 countries. No new conflicts were added to this year’s report, and one conflict was removed. The conflict between the Communist Party of the Philippines (CPP) and the Philippines was removed as each of the preceding two years produced fewer than 25 deaths. However, the conflict between Muslim separatist groups in the Mindanao islands region of the Philippines persisted, with more than 500 deaths in 2016. The regional distribution of armed conflict was basically the same for the last two years. Africa and Asia continued to have the most conflicts (12 and nine, respectively), with India still hosting three separate, internal conflicts. The Middle East continued to host five armed conflicts, while Europe and the Americas had the fewest conflicts (two and one, respectively). Syria continued remained the world’s top source country for refugees. By mid-2016, 4.8-million Syrians had fled the country as refugees and more than 6.1-million people were internally displaced. By the end of the year, the total death toll had risen to more than 400,000. In fall 2016, a historic peace deal was negotiated to end the civil war in Colombia – the only remaining conflict of its kind in the Western hemisphere. 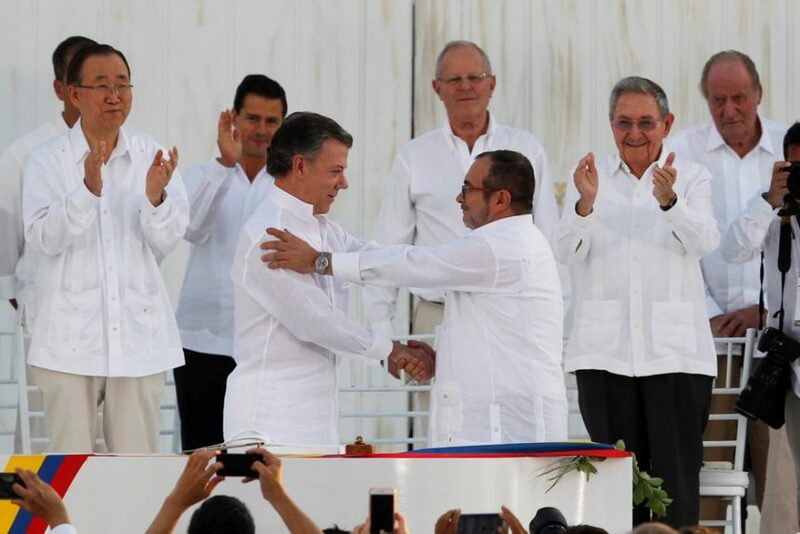 After 52 years of conflict, the Revolutionary Armed Forces of Colombia (FARC) reached a comprehensive peace agreement with the Government of Colombia in which they promised to abandon armed struggle and become a legal political party. In an October referendum, Colombian citizens rejected the proposed peace accord by less than half a percentage point, but the two parties signed a revised deal on November 24 that Congress approved on November 30. Project Ploughshares has reported annually on armed conflict since 1987. Is your data on armed conflict by country available for download in report form or a spreadsheet. I would like to use it in my research on restrictions on religion. Hi Roger, The data is not available in report form or spreadsheet yet. We are working on this and hoping to have it for the 2019 report. Our apologies. May I please request you to send the report on conflict by country in spreadsheet form when it becomes available.I would sincerely appreciate .I am specifically interested in conflict in Colombia. Hello Dilip, Thank you for your interest in our work. The ACR team will be in touch with you in the coming months. We are working on preparing a searchable report for this year. Thank you so much mme.Tasneem.